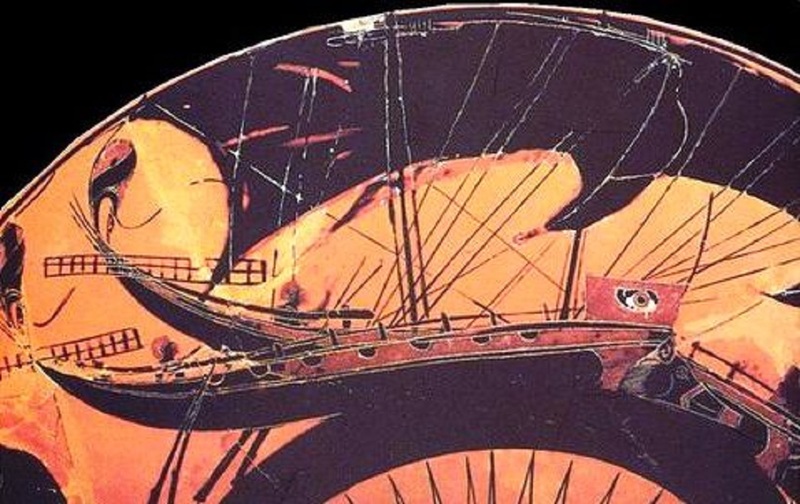 AS HEIRS of the Minoans, the Mycenaeans assumed control of the “Tin Routes” – that is, the maritime trade network of metals from the Occident. Their acme lasted for about 250 years until the Bronze Age collapse. This extensive network sheds some light on the reason why Mycenaean artifacts have been found well outside the limits of the Mycenaean world: swords located as far away as Georgia in the Caucasus; an amber object inscribed with Linear B symbols in Bavaria, Germany; double axes and other objects from the 13th century BCE in Wessex and Cornwall, England, and in Ireland. 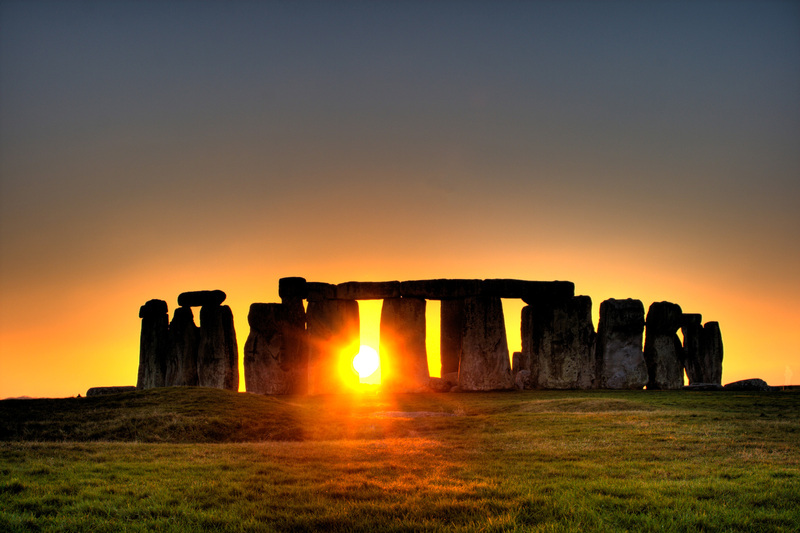 There is convincing evidence that during the final phase of construction of Stonehenge in Wiltshire, around 1600 BCE, the builders were in commercial contact with “the great contemporary Mediterranean civilizations of Minoan Crete, Mycenaean Greece, Egypt, and the ancestors of the travelling-trading Phoenicians,” as Gerald Hawkins said. 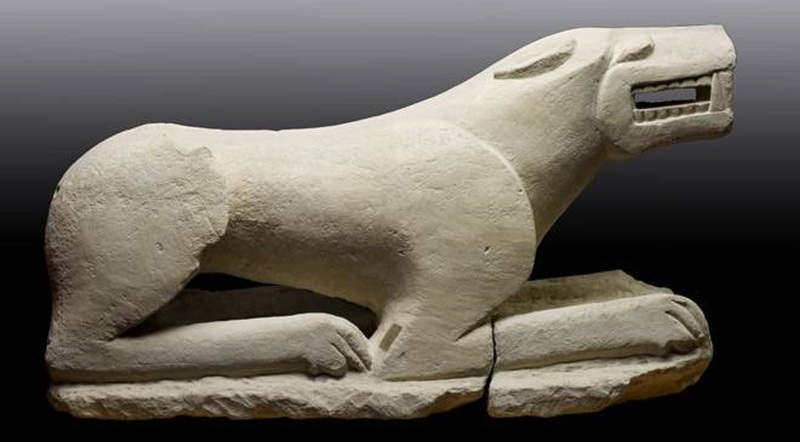 (a) The grave of a Mediterranean teenage boy that died ca 1550 BCE and several items of Mediterranean origin have been found in the burial ground of Stonehenge. 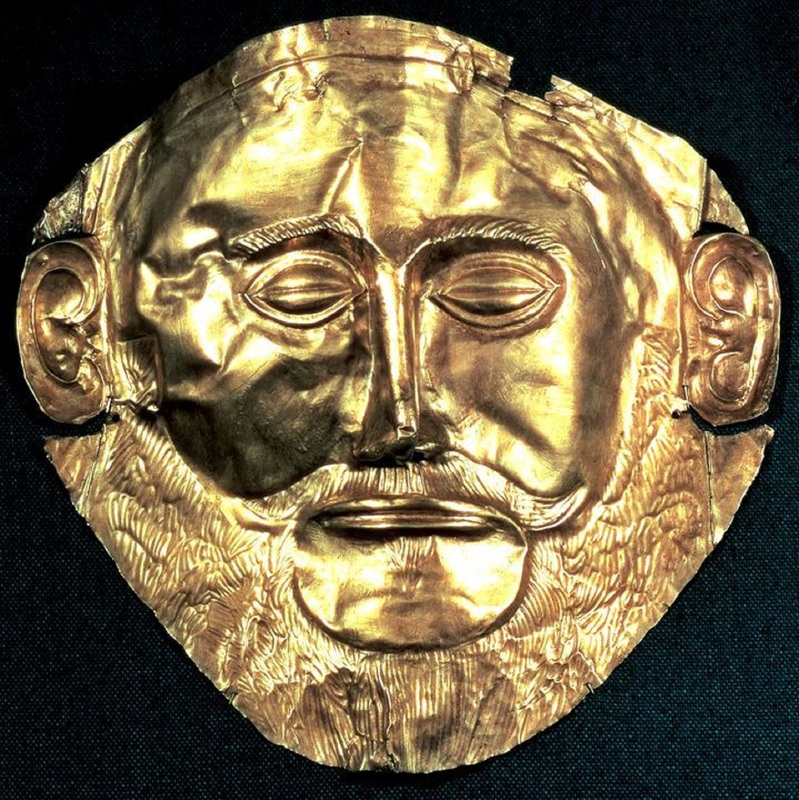 The Mycenaean period (ca 1600–ca 1100 BCE) is the historical setting of much Hellenic literature and myth, including the Epic Cycle and Greek tragedy. 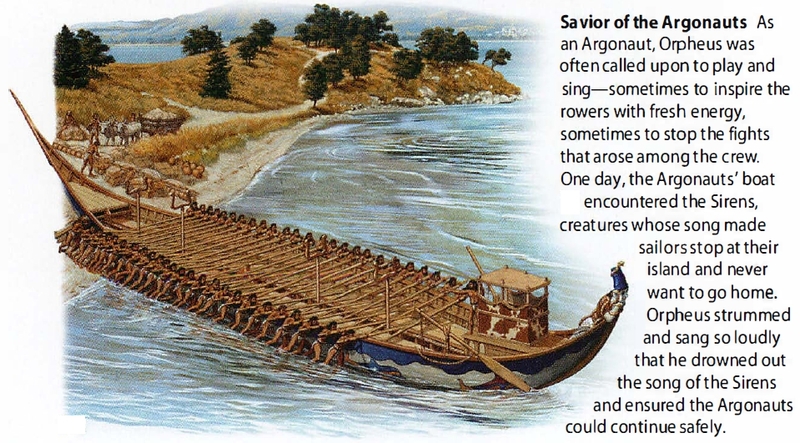 Historians have traditionally blamed the collapse on an uprising or an invasion by another Hellenic ethnic group, the Dorians, though at least one of the Mycenaean centres, Pylos, was most probably destroyed by the so-called Sea Peoples. 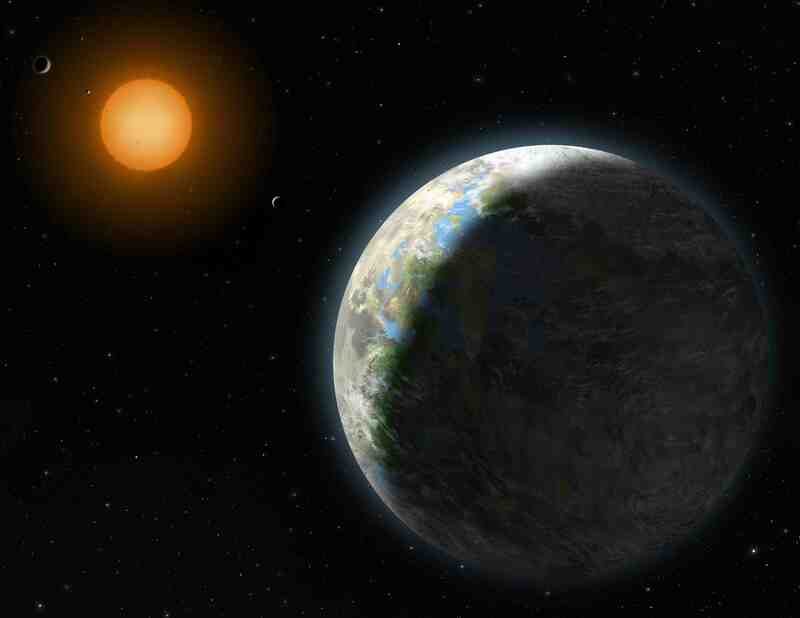 (b) There are also theories of natural disasters or large-scale drought, which could have contributed, as well. The movements of people from the Balkans and Anatolia to the Near East at that time were quite real. The internal factors theory has the Mycenaean civilization falling in the course of societal conflicts brought on by a rejection of the palatial system by the underprivileged strata of society, who were quite impoverished by the period’s finale. Another hypothesis mingles social with ethnic divisions. In this context it has to be stressed that the Iron Age made large numbers of comparatively cheap weapons accessible to all. War was no longer a privilege of the aristocracy. The iron weapons were not as good as the bronze ones, but they could still kill… (See the previous Chronicle 2). (b) The Dorian invasion is a concept devised by ancient Greek historians to explain why pre-classical dialects and traditions in southern Hellas were replaced by the ones that prevailed in the classical era. 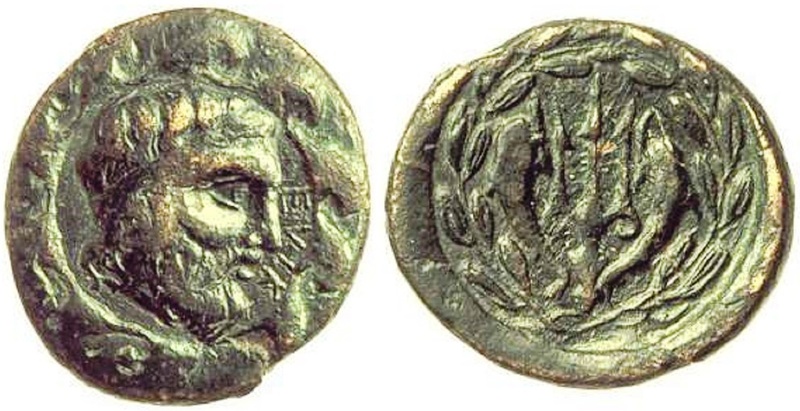 Greek legend asserted that the Dorians took possession of the Peloponnese in the so-called ‘Return of the Heracleidae’. The meaning of the concept has changed several times, as historians, philologists, and archaeologists used it in attempts to explain the cultural discontinuities expressed in the data of their fields. The pattern of the arrival of Dorian culture on certain islands such as Crete is also not well elucidated. Despite 200 years of investigation, the historicity of the Dorian invasion has not been established. The Sea Peoples were a confederacy of seafaring raiders from Southern and Central Europe and the Mediterranean, especially the Aegean Sea area, who sailed (and then also marched) east invading Hatti, Cyprus, Syria, Canaan, and Egypt, and bringing about the Bronze Age collapse. Pharaoh Merneptah explicitly refers to them by the term “the foreign-countries (or ‘peoples’) of the sea”. Omitting Mycenaean Hellas from the list of the victims, some scholars believe that they can identify most of the Sea Peoples mentioned in Egyptian records: They were supposedly Achaeans (Ekwesh; if they were, why then should they destroy Pylos? – “Because they were Hellenes!”, is the sardonic answer…); Tyrrhenians (Teresh), ancestors of the Etruscans; Lycians (Lukka); Sardinians (Sherden); Sicilians (Shekelesh); Philistines, that is Palestinians (Peleset), possibly coming from Crete; and Teucrians (Tekrur), who could be either Trojans or Greeks! The Peleset and Tekrur were the only major tribes of the Sea Peoples that settled permanently in Canaan. Note that several of these peoples had been used as mercenaries or ‘allies’ by the Egyptian and Hittite Empires before they turned against them (see Chronicles 4 and 5). Mycenaean settlements were not confined in southern Hellas, but also appeared in Epirus, Macedonia, islands of the Aegean, the Asia Minor coast, Cyprus, Canaan and Italy. The towns were well fortified, in contrast to Minoan Crete. The best Mycenaean palaces were excavated at Mycenae , Tiryns, and Pylos. They were the heirs of the Minoan palaces but inferior to them. The heart of the palace was the megaron, the throne hall. Staircases found in Pylos indicate that the palaces had two stories. Located on the top floor were probably the private quarters of the royal family. Supreme power appears to have been held by a king, identifiable in the Homeric ἄναξ (‘divine lord’, ‘sovereign’, ‘host’). His role was military, judicial, and religious. 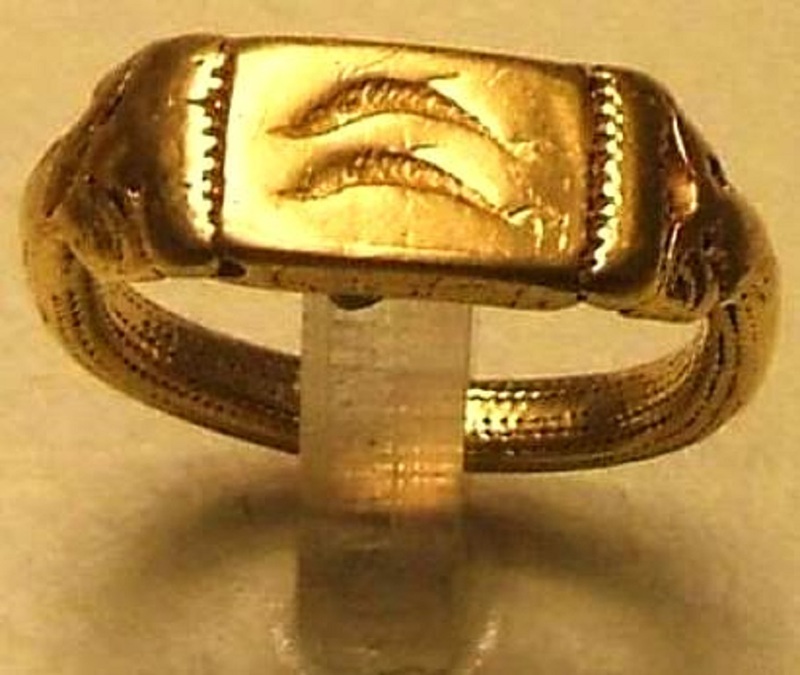 Occurrences of the word in texts having to do with offerings suggest that the sovereigns were worshiped. Apart from that, no priestly class has yet been identified. Furthermore, it remains problematic to pick out a place of worship with certainty. It seems that many gods and religious conceptions of the Minoans were fused in the Mycenaean religion, the mother of the classical Greek religion. The Eleusinian mysteries were established during the Mycenaean period on a pre-Hellenic vegetation cult with Minoan elements. Demeter and other gods appear in Arcadian myths as animal-headed. Representations of processions with animal masks, or of ‘daemons’, remind us of the Hellenic myth of the Minotaur. Dionysos, the only Greek god who died in order to be reborn as he often appeared in the religions of the Orient, was related to the Minoan myth of the ‘Divine Child’ who was abandoned by his mother and then brought up by the powers of nature. 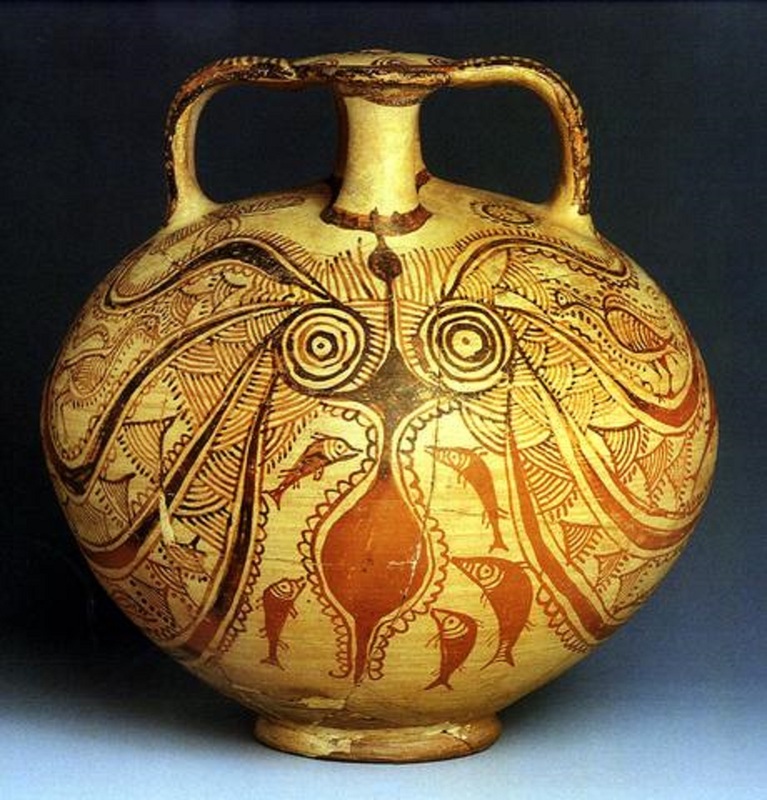 (c) Mycenaean painting was very much influenced by Minoan art. Bull-jumping frescoes are found at Mycenae and Tiryns, as well. However, the Mycenaeans depicted the animals only in relation to man or as victims of the hunt, and thus displayed a different relation to nature compared to the Minoans. (c) The stories of the ‘Divine Child’, or ‘Baby Moses’, or Habis, an Odysseus and Calypso’s son (we will meet him when we voyage to Iberia, see Chronicle 6), etc. are anything but unique, as they are found in many cultures, based on the same idea but without necessarily from the same origin. Similarly, the Deluge myths, in connection with a Megaflood due to the last deglaciation, are also widespread among many cultures all around the world. The Mesopotamian Atrahasis, Deucalion, Noah etc. are heroes with the same background. It is a pity that modern Greeks are more familiar with Noah than Deucalion. The reason is that these stories are related as myths, tales, except those in the Bible, which are considered ‘sacred’. But what else is the Bible if not Hebrew mythology? 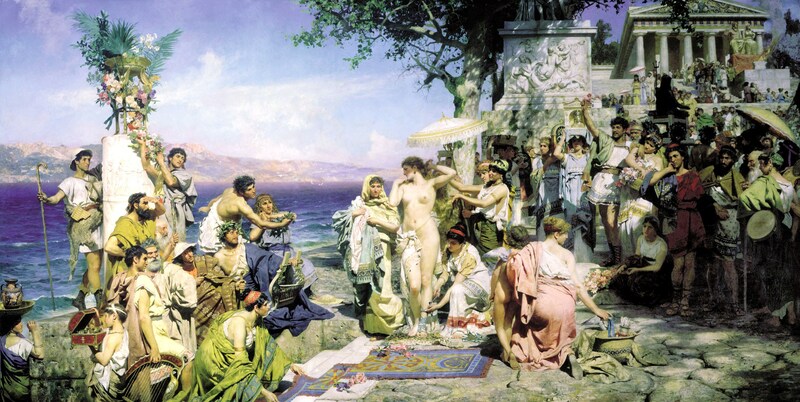 The Eleusinian mysteries (Ἐλευσίνια μυστήρια) were initiation ceremonies held every year for the cult of Demeter and Persephone based at Eleusis in Hellas. Of all the mysteries celebrated in ancient times, these were held to be the ones of greatest importance. It is acknowledged that their basis was an old agrarian cult which probably goes back to the Mycenaean or rather Minoan periods. The mysteries represented the myth of the abduction of the daughter (“kore”) from her mother by the king of the underworld Hades, in a cycle with three phases: the “descent”, the “search” and the “ascent”, when Persephone was reunited with Demeter. Her resurrection was symbolic of the rebirth of all life. The rites, ceremonies, and beliefs were kept secret. Since the rituals involved visions and conjuring of an “afterlife”, some scholars believe that their power and longevity came from psychedelic agents. The only requirements for membership were freedom from “blood guilt”, meaning never having committed murder, and not being a “barbarian” (unable to speak Greek). Nevertheless, the festival later spread to Rome. Women and even slaves were also allowed initiation. Comparative studies show parallels between these Hellenic rituals and similar systems in the Near East, such as the cults of Isis and Osiris in Egypt, the Syrian and Persian cults and, of course, the Thracian–Phrygian Cabeirian mysteries. 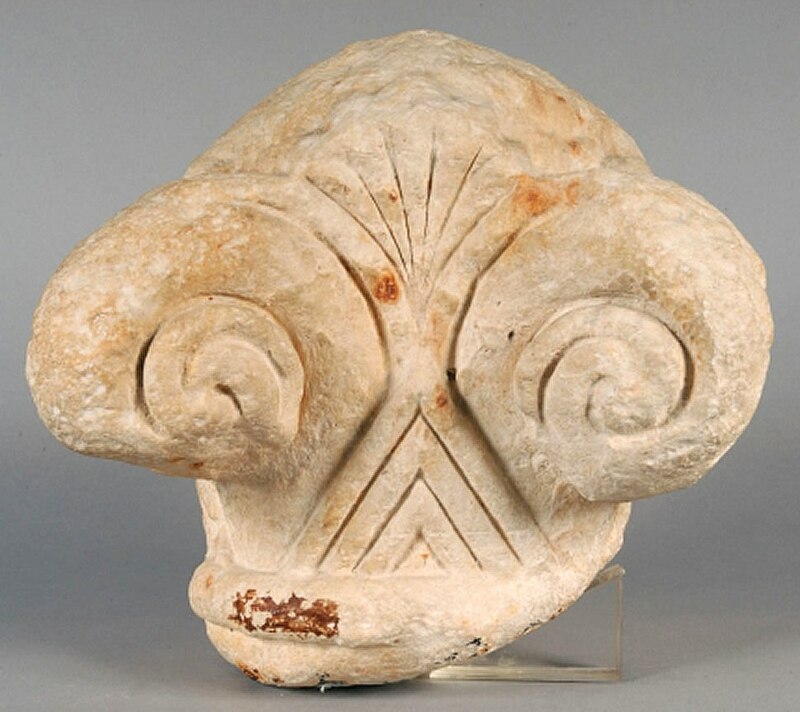 The Cabeiri (Κάβειροι) were enigmatic chthonic deities, protectors of sailors, who were imported into Hellenic ritual and may have also included Hittite and proto-Etruscan elements. They were worshiped in a mystery cult closely associated with that of Hephaestus, centered οn the north Aegean islands of Lemnos and Samothrace, and also at Thebes. Other places of worship included Imbros and Seuthopolis in Thrace, and various sites in Macedonia, Asia Minor and the rest of the Aegean. The Samothracian cult spread during the Hellenistic period, eventually initiating Romans. As the cult’s origin was non-Greek, the “barbarians” were also accepted: the initiation had no prerequisites for age, gender, status or nationality. Everyone, men and women, adults and children, the free or the enslaved, Hellenes and non-Hellenes, could participate. 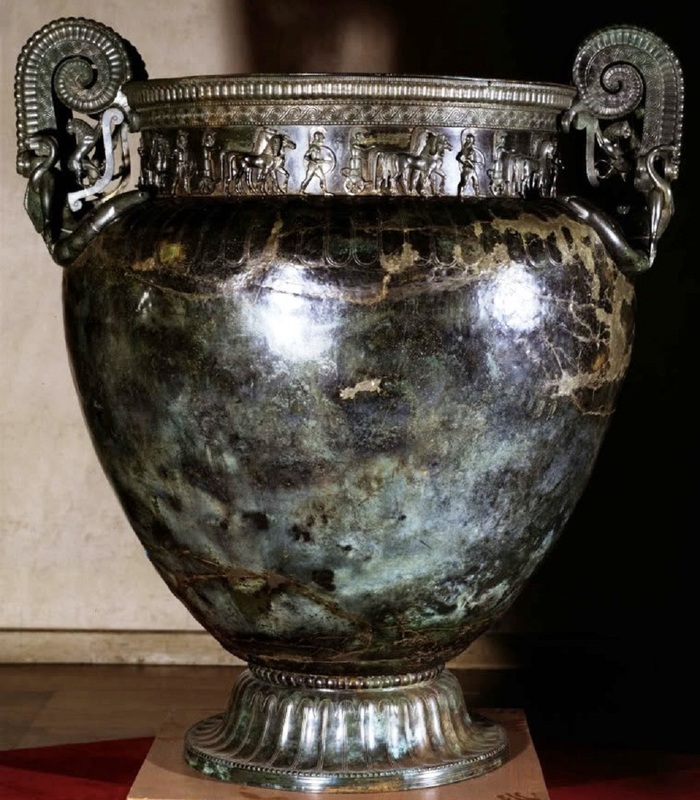 After all, both the Samothracians and Lemnians were originally non-Greek: the Lemnians were possibly related to the Etruscans; they were Hellenized after Athens conquered the island in the 6th century BCE; however, the cult of the Cabeiri survived the period of Hellenization. The Samothracians were associated with the Trojans and Pelasgians; in the Sanctuary of the Great Gods they used a so-called “barbarian” language even in Roman times. Thebes was connected to Samothrace, primarily through the wedding of Cadmus and the Samothracian Harmonia. The Cabeiri also bear many similarities to other fabulous races, such as the Telchines, Cyclops, Dactyls, Corybantes, and Curetes. These groups were often confused or identified with one another since many of them were also associated with metallurgy – just like Hephaestus. The Orphic mysteries (Ὀρφικά) may have also had their origins with the Cabeiri. They were religious beliefs and practices originating in the Hellenic and Thracian worlds, associated with literature ascribed to the mythical musician and poet Orpheus, who descended into Hades for his beloved Eurydice and returned. Orphics also revered Persephone and Dionysus for the same reason. 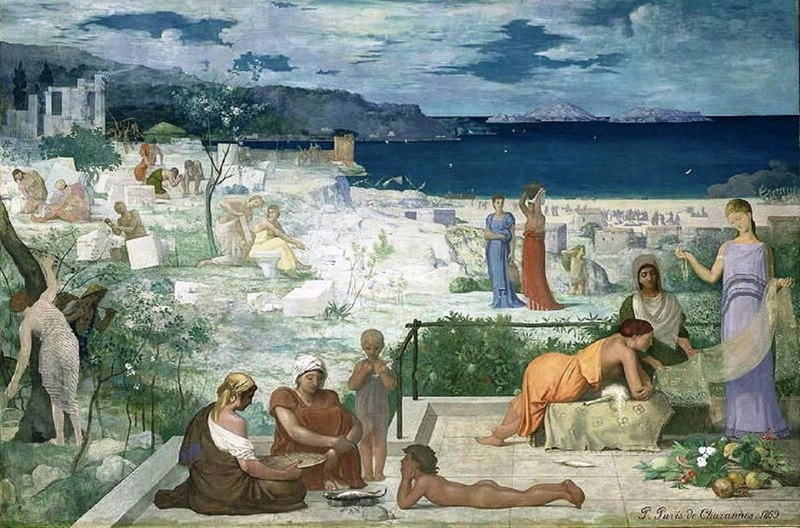 As in the Eleusinian mysteries, initiation into Orphism was associated with an “afterlife”. Emperor Theodosius I closed the sanctuaries by decree in 392 CE. Two years before, in 390, he had ordered his troops to commit one of the most horrific massacres in history, slaughtering at least 7,000 Thessalonians in the Hippodrome, because they had rebelled against the emperor’s Germanic garrison,(*) and the imposition of Christianity with the abolition of the Edictum Mediolani (313 CE) on freedom of religion. As soon as the Christians were free of persecution, they started persecuting all the others, thanks to Theodosius the “Saint” (for the Christian Church), the “Great” (for the official History)… The last remnants of the Mysteries were wiped out in 396, when the Goth king Alaric invaded Eleusis accompanied by Christians “in their dark garments” – the “Blackshirts” and “Sturmabteilung” (SA) of the time – desecrating the old sacred sites and killing all the priests… Alaric halted slaughter and plunder only when he was appointed magister militum by the emperor. He surely deserved better: sanctification! (*) Most of the Theodosian dynasty emperors, as well as the last ones of the Western Empire, were puppets of Germanic kingmakers, the so-called magistri militum (military masters) or stratelates, such as Aspar in the East, and Ricimer in the West. (See Chronicle 7+ on the violent Christianization of the Empire). Commerce remains curiously absent from the written sources in Linear B. 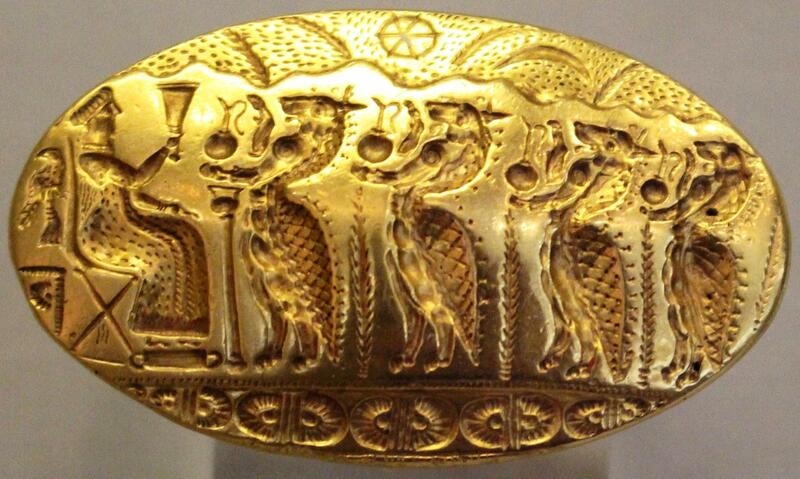 However, it is known that the Minoans exported fine fabrics to Egypt; the Mycenaeans no doubt did the same. Most probably they borrowed knowledge of navigational matters from the Minoans, as is evidenced by the fact that their maritime commerce did not take off until after the collapse of the Minoan civilization. 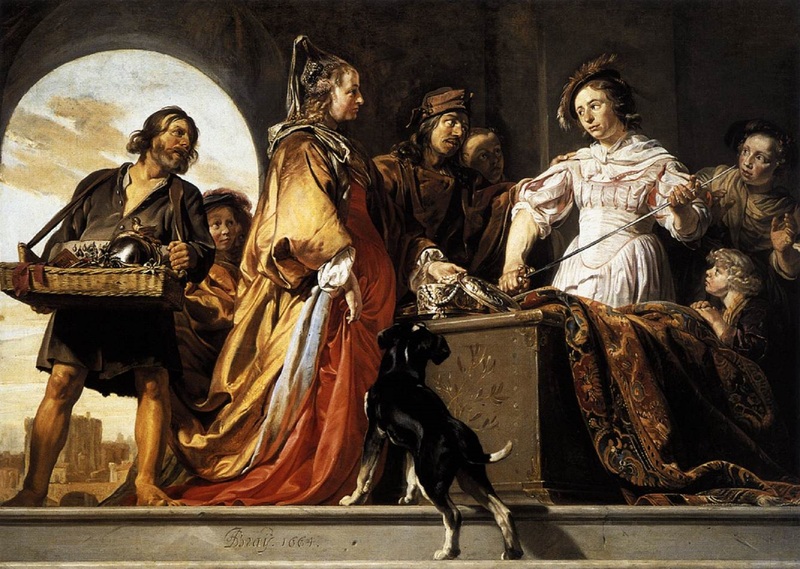 It seems that certain products, notably fabrics and oil, even metal objects, were meant to be sold outside the kingdom, because they were made in quantities too great to be consumed solely at home. Pottery was also produced in great quantities. Especially after the conquest of Minoan Crete, production increased considerably, notably in Argolis, the area of Mycenae, with great numbers exported outside Hellas. The products destined for export were more luxurious and featured heavily worked painted decorations incorporating mythic, warrior, or animal motifs. The Mycenaeans’ network extended as far as southern Spain, Britain, and central Europe, while their pottery has been found in Sardinia, Sicily, southern Italy, the Aegean, Asia Minor (amongst others at the old settlement of Miletus where high-quality Minoan and Mycenaean ceramics have been recovered), other parts of Anatolia, Cyprus, Canaan and Egypt. Minoan and Mycenaean foreign trade is one of the most important chapters of the Bronze Age history and an open challenge to every archaeologist and historian. The Mycenaeans, as conquerors of Crete, became heirs to the Minoan thalassocracy; but they did not last long. The Trojan War, that took place in 1194-1184 BCE according to Eratosthenes,(d) the Sea Peoples’ raids, and the great instability of the epoch, led to their downfall during the Bronze Age collapse. Many historians believe the transition to the Iron Age was violent, sudden and culturally disruptive. The Aegean and Anatolian palatial civilizations were replaced, after a hiatus, by the isolated village cultures of the so-called Greek Dark Ages, which were dark, indeed, but not only Greek. In just 50 years, in the first half of the 12th century, the downfall of the Mycenaean world and the Hittite Empire, the catastrophe in Syria, Canaan, and Egypt, and the cultural collapse that followed, resulted in the interruption of trade routes and the severe reduction of literacy. The Mycenaean Linear B writing was forgotten. The Hellenes would need to re-invent writing in the late 9th or early 8th century BCE. (e) In this period almost every city was violently destroyed and often left unoccupied thereafter, such as Hattusa, the Hittite capital, Mycenae, and Ugarit. Troy was destroyed at least twice, before being abandoned. Fewer and smaller settlements suggest famine and depopulation. 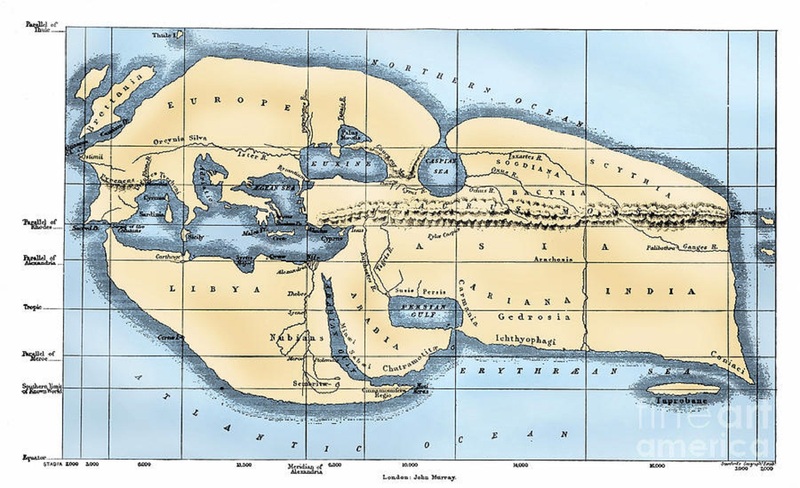 (d) Eratosthenes (Ἐρατοσθένης, ca 276–ca 195 BCE), from Cyrene, was a geographer, astronomer, mathematician, poet and music theorist (characteristic of the ancient scholars’ global knowledge and eruditeness). He was the first person to calculate the circumference of the Earth and also the tilt of the Earth’s axis with remarkable accuracy. He may have also accurately calculated the distance from the Earth to the Sun. He was the first person to use the word ‘geography’, invented a system of latitude and longitude, and made the first world map incorporating parallels and meridians in his cartographic depictions based on the available geographical knowledge of the era. He invented the leap day, and was the founder of scientific chronology, trying to fix the dates of the chief political and literary events from the conquest of Troy. Eratosthenes was a chief librarian of the Great Library of Alexandria in Ptolemaic Egypt. The library, a major centre of science and learning in the ancient world, was repeatedly destroyed by Romans (Julius Caesar in 48 BCE, Aurelian in the 3rd century CE), Christians (Theodosius and Patriarch Theophilus in 391) and Muslim Arabs (`Amr ibn al-`As in 642), resulting to an irretrievable loss of knowledge for mankind. (e) The Greek alphabet, probably derived from the Phoenician ‘alphabet’, was in turn the ancestor of numerous other European and Middle Eastern scripts, including Latin and Cyrillic. However, a very important change was made in adapting the Phoenician system to Hellenic, namely the introduction of vowel letters. The Greeks were obliged to make the same innovation twice because the vowels are significant in their language. Adapting the Minoan Linear A script to their needs, the Mycenaeans borrowed 87 Cretan symbols; 82 corresponded to syllables and five to vowels. Linear A is still not deciphered and so we ignore if this brilliant idea of the vowel letters was Cretan or Hellenic. According to the definition used by modern authors, this feature makes Greek the first alphabet in the real sense, as distinguished from the purely consonantal Semitic ‘alphabets’, which are called “abjads” (derived from the Arabic word for ‘alphabet’). The Phoenician abjad belonged to the family of the closely related West Semitic scripts. The Trojan War was just an act of this tragedy on a big scale involving numerous ethnicities: the fighters in the alliance of Troy are depicted in the Iliad as speaking various languages and thus needing to have orders translated to them by their commanders. On the Greek side instead the Trojan campaign was anything but Pan-Hellenic: even the great hero, Achilles, tried to evade ‘conscription’ disguised as a girl in the palace of Skyros! Several areas, e.g. Macedonia, Epirus, and in part Thessaly, stayed away, probably because they were under the control of the Dorians, who would proceed to the Peloponnese some time later, filling the vacuum created by the demise of the Mycenaeans. None of the palaces survived and up to 90% of small sites were abandoned suggesting depopulation on a major scale. Athens and some other cities continued to be occupied but with a more local sphere of influence, limited trade and an impoverished culture, from which they took centuries to recover. The Dark Ages would last for more than 400 years. After ca 1100 BCE, the decoration on Hellenic pottery lacks the figurative adornment of Minoan or Mycenaean ware and is restricted to simpler, generally geometric styles (1000–700 BCE). It’s the reason why this age is also called Geometric, or Homeric, due to the composition of Homer’s epics, ca the 8th century, and the entire Epic Cycle. Those epics, a by-product of the new alphabet and inspired mainly by the Trojan War and its repercussions that would later feed the tragedians’ imagination, together with the emergence of the Greek poleis in the 9th century, were the first signs of recovery in Hellas. The catastrophe was even worse in Anatolia. Every important site shows a layer of destruction. Here civilization possibly did not recover to the level of the Hittites for another thousand years. Cyprus witnessed two waves of destruction: by the Sea Peoples ca 1230, and by Aegean refugees ca 1190 BCE. In Syria, Ugarit was burned to the ground. In addition, the cities along the coast from Gaza northward were destroyed. However, strangely enough, the raids did not affect the Phoenician cities; they were confined in southern Canaan. Assyria, who was protected by the best army in the world, also remained intact; nevertheless, it withdrew to its borders for a long time. As for Egypt, although victorious against the invaders and surviving for a while, it succumbed some time later. 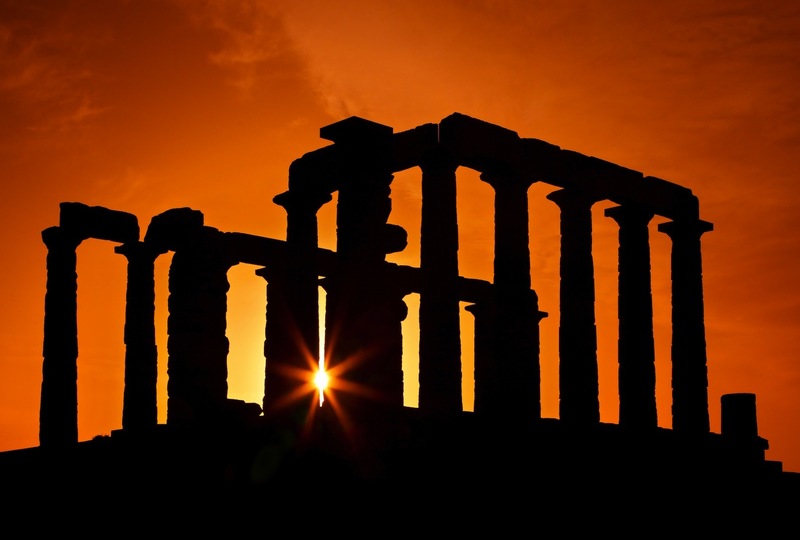 Robert Drews describes the Bronze Age Collapse as “the worst disaster in ancient history, even more calamitous than the collapse of the Western Roman Empire”. A number of people referred to the cultural memories of the disaster as stories of a “lost golden age”. Hesiod e.g. spoke of Ages of Gold, Silver and Bronze, separated from the modern harsh cruel world of the Age of Iron by the Age of Heroes. It seems that the disruption of long distance trade, an aspect of the so-called ‘systems collapse’, cut easy supplies of tin, making bronze impossible to produce. The disruption of long distance trade cut easy supplies of tin, making bronze impossible to produce.